I’m a little bummed. You see, I thought that I was finally going to get a real haircut this weekend and I planned to surprise you all with the results today. But, to my disappointment, my appointment had to be cancelled unexpectedly. that has all but grown out, except for the last 6″ or so of my hair. Back then, I told her that I liked big hair, that I wanted to keep as much of my length as possible and that I wanted a slight layer in the back and some long layers around my face. That’s exactly what I got. So, I trust that she will, 1. Listen to my concerns and honor my requests, 2. Give me as close to what I want as possible. Second, this cut is long overdue. I had a small trim (about an inch on the longest areas and less that on the shorter lengths) a little while ago, but that really didn’t do enough. In fact, I think the way that it was cut may have caused even more unevenness than I already had. My last significant haircut was in February 2011. Since then, I’ve just been doing S&Ds to get rid of SSK and split ends. Between that, varying growth rates, different curl patterns and breakage in my crown, my perimeter has become an irregular mess! It’s usually not too noticeable, because I wear my hair in updos most days of the weeks or TnCs when it’s down. However, I really want to revisit WnGs as my weekend style this summer. I also want some layers to break up the curtain of hair around my face and to add some volume. 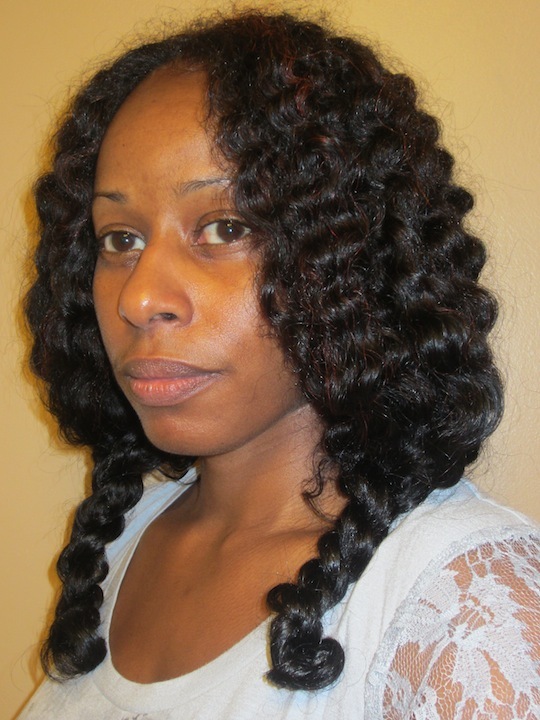 I mean, have you seen what layers did for Curly Nikki and Antoinette of Around the Way Curls? Alas … it was not meant to be … at least, not this weekend. Instead, I had to look at my scraggly ends and dream of the day when they would be a memory of the past. Since I can’t tell you about my wonderful new cut, let me give you a brief recap of wash day and share pics, so that you’ll understand my pain. 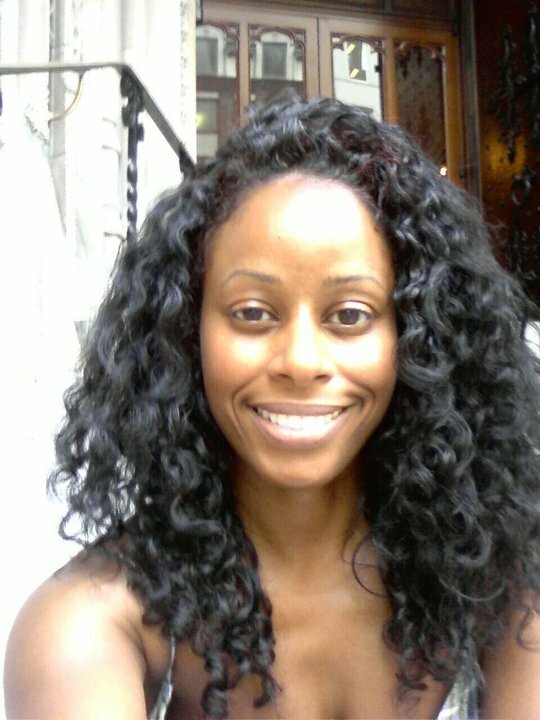 If you recall, I applied a pre-poo of Aubrey Organics Honeysuckle Rose Conditioner (AO HSR) and Vatika oil the Sunday before last and placed my hair in 4 twists. Yeah … I didn’t take them out or wash my hair until the following Saturday … morning … ish. I decided to try the Aubrey Green Tea Shampoo, which is lathering, but sulfate free, to clarify my hair in prep for the big day. I diluted it with water in a dye applicator bottle and applied it to my scalp where it created a very rich lather. I squished it down my twists and rinsed. Then, I whipped out the Aubrey Green Tea Cream Rinse and diluted that in water, as well, before applying. Unfortunately, I ran out and ended up grabbing a couple of other conditioners to finish the job of detangling (side note: My detangling session was a little rough as my roots were pretty matted … I wonder if they would have been as difficult to get through if I had used the diluted DevaCare No Poo?). 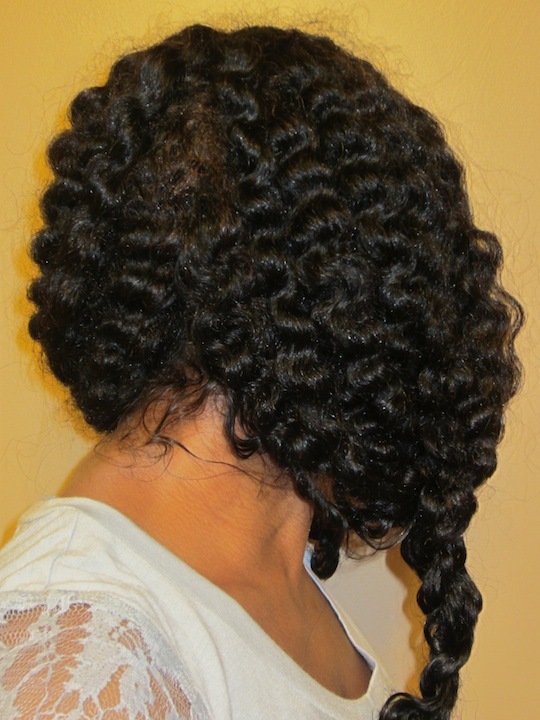 Once I finished detangling each section, I re-twisted and then rinsed with cold water under the tub faucet. Next, I hopped out of the shower and used a Curl Cloth to blot dry and then wrapped around my hair to sop up the drippies. When my hair was barely damp (15 minutes later), I applied AO HSR as my leave-in and placed my hair in twists that I sealed with my JBCO/EVOO mix. (My plan was to stretch my hair so that it would be easily detangled when it was wet again for my cut on Sunday.) Later that evening, I oiled my scalp with Wild Growth Hair Oil (WGHO) and applied a little WGHO Light to the length of my twists. 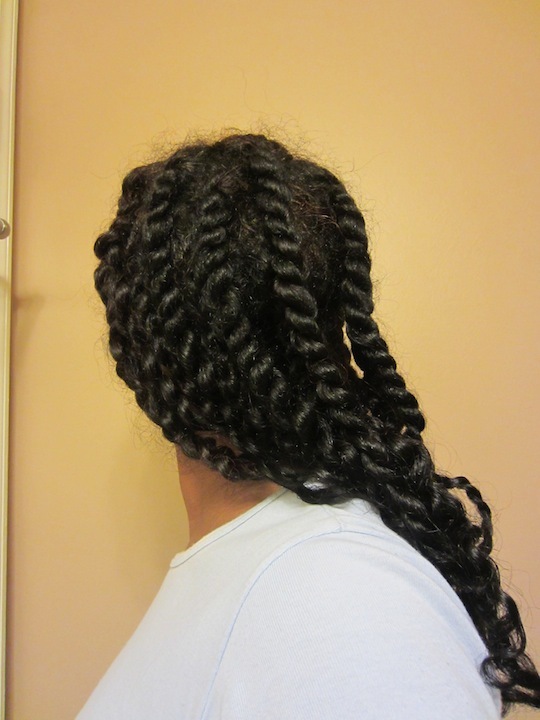 Again, I was very pleased with how much fuller my twists are appearing and how my hair feels strong, but soft. I also think my shedding was not bad given that my hair was twisted up all week. Anyway, so I was really looking forward to Sunday … then, I got the e-mail that advised me that my appointment had to be cancelled because of an emergency. *sigh* Oh well. So, on Sunday around noon, I released my twists to find a very defined and shiny twist out … with sad, scraggly and crazy looking ends. I really should have set them on rollers the night before, but was just too lazy to do so. Ughhhh … like seriously, as I’m writing this post and looking at this pic, I’m thinking, “What the heck?!? Maybe I should chop it all off! !” But, I know that the gappiness is partly attributable to the tighter curl pattern in my crown and the longer section under the crown. I also know that, with a little fluffing, it really isn’t as bad as it looks above. But man, most of this excess length really needs to go and some layers around my face will deal with that henna loosened section on the left. I think that my “lead hair” is more than 2-3 inches longer than the bulk of my hair and it’s driving me crazy seeing it like this. I also think that my crown area needs to be trimmed neatly as all of the irregular lengths are resulting in more tangling. I read this post on BGLH.com recently, 7 Tips for Repairing Crown Area Thinning & Breakage, that indicated that it’s important to keep the crown area trimmed and as neat on the ends as possible. 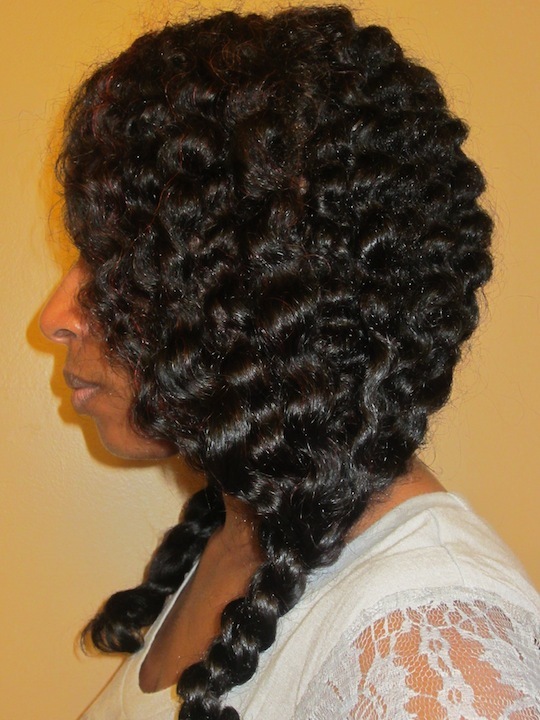 If your hair is layered, you really want to make sure that the ends that are originating from your crown are kept neat. Uneven, splitting or otherwise frazzled hair easily tangles itself and can lead to a cycle of crazy breakage. Hairs should be able to move freely past other hairs without “catching.” This “catching” can lead to breakage in and around the crown area of the head. I’ve had my share of crown area breakage issues! What I ended up doing was isolating my crown area and trimming it down to a blunt length. It was much shorter than the rest of my hair, but the trim allowed me to focus on the area—to treat it separately and to comb it separately until it improved. So, all that being said, I’m really hoping to get this appointment re-scheduled soon so that I can debut a fabulous rear view to you guys in the near future!! Although I like the volume the extra length gives my buns and updos and I feel that the hair is pretty healthy, I know that I’ll be happier with a fuller and more even perimeter. I also know that it’ll grow back by the end of the year and I think that it’ll be thicker, fuller, curlier and even healthier because of the tweaks I’ve made to my regimen. 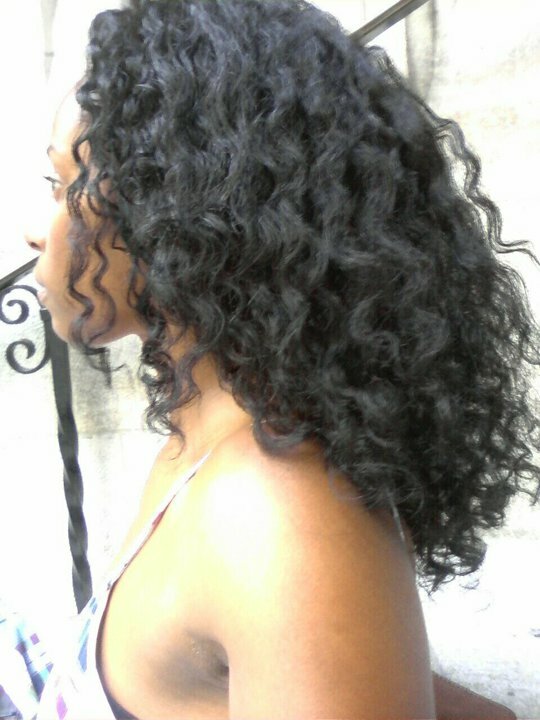 With that, here are a few pics where I twisted my ends together to help blend them better. It’s a technique I use to stretch the curlier areas and curl the straighter ones to create a similar wave. Sometimes it works … sometimes it doesn’t. But, I liked these pics because you can see the great definition and shine that I got from the twists with only AO HSR as a leave-in. I definitely think all of the AO products have had a hand in giving my twist and braid outs better definition and have also resulted in my hair drying far more quickly!! Again, Aubrey Organics is a keeper!! Would/have you sacrifice(d) healthy length for a better cut/shape? Yea I was comming down too! I scrounged a couple of dollars together to get my hair done too! But oh well .Maybe another time. I cant really afford the Salon so I catch Tameeka on the pop up! Tiffany, we may be able to get a “house call” with enough people! I really don’t want to wait another month! So, if an earlier event isn’t scheduled, I’ll be reaching out to Tameeka to see what I can hook-up. I’ll definitely let you know and will include you if you want to head to Jersey. Shoot, we may need to ask your parents if we can do it at their house as I live another good 30-45 minutes from Orange;)!! Hmm…I desperately need a professional trim, so I might need to jump on the bandwagon. You should consider videotaping your salon visit when it finally happens. LOL!!! I was waiting for that e-mail Rhonda!!! So glad to know that now you approve;)! And, I’m serious too:)! And what a GREAT idea!!! I’ll have to see if she’ll let me tape parts of it:)!! I was hard pressed….the picture sealed the deal. Don’t get it twisted though…I am still not emphatically sold, but no longer the hold out. Keep me posted on your plans. PS. I need to hit the road all points north and join you. I desperately need a professional trim. Even though you had to reschedule your hair still looks great. I would like to know if you still Henna your hair? I read where you said it relaxed your curls. Good or bad? My daughter has hair like yours and we were considering henna for her hair? Thoughts? Thanks so much and LOVE your blog. Many Blessings!! Awww Robin, what a sweet lie;)! LOL! Seriously, thnak you:). Yes, I still henna, in fact, I did two henna treatments (roots only) in the last 3 weeks:). Doing roots only applications has enabled me to keep my curl pattern. 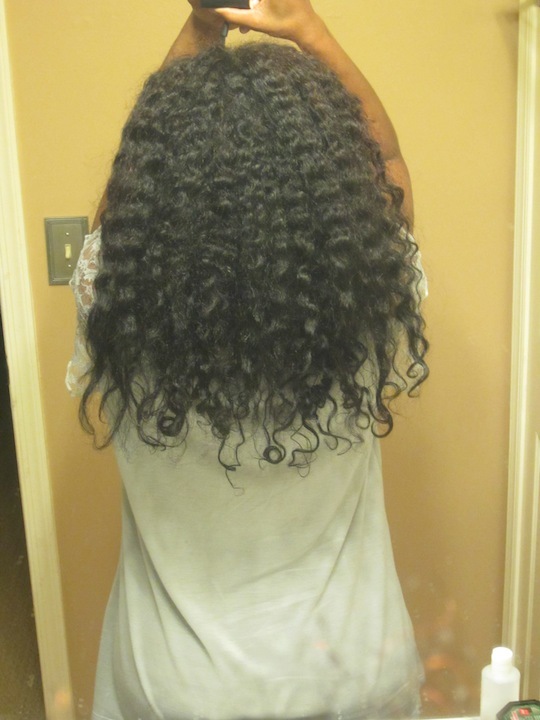 When I was doing bi-weekly, full length treatments (probably did 10-12), I had SIGNIFICANT curl loosening. Doing roots only to get new growth three times gives me the benefits without the curl loosening. 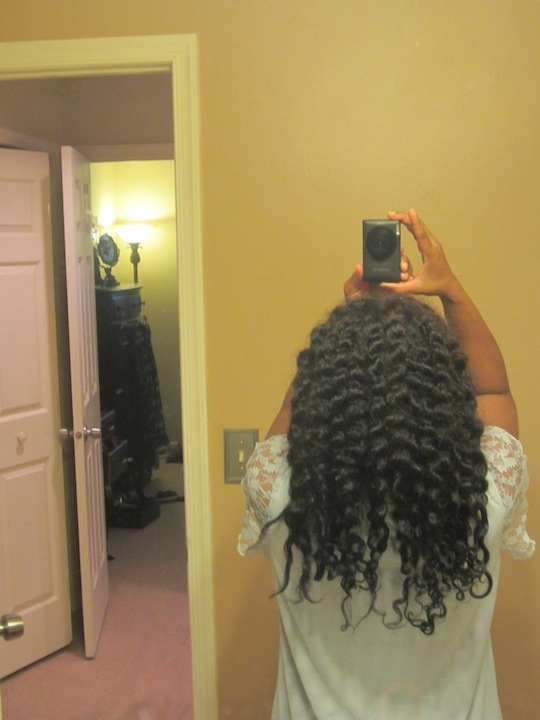 For me, curl loosening was bad … others find that a desirable result. So, good or bad is in the eyes of the beholder. And thank you sooo much:)!! I’m glad that you love it and hope you keep coming back for more:)!! So, you know I chopped off all mine and I couldn’t be happier with the shape, the fullness and just suitability to my face. I love my hair now and although I will try growing it out again, if I ever felt I was sacrificing all the things mentioned above for length, then chop chop it goes again. I do love your cut Christabel! It is soooo cute and flattering on you! Maybe you subliminally inspired me;). I’ve always been really nervous about cuts and the idea of sacrificing my growth is scary to me. That said, your cut in 2010 looks AMAZING so maybe I should just go for it. My hair isn’t nearly as long as yours (I’ve been natural for 2 1/2 years) but I do have uneveness. My birthday is this week, so we’ll see. I’ll let you know if I go through with it! I agree that a new cut to trim off the uneven ends would best. I had a mini cut myself and it was worth it. My hair is shorter, but much fuller and healthier. By not cutting it, you are sacrificing health and a better looking TNC and WnG’s. I would have said no in the past but I’m leaning toward yes since I don’t like the results of my twist outs. Good luck Shelli! I had my hair cut about 3 months ago…and I can now rock a WNG. All of the straight/damaged pieces are gone and I love it! Makes mornings so much easier! Sorry about the delay in your hair cut Shelli. We are always hesitant about cutting our hair which is really silly when you think about it – our hair grows as long as we’re living. It’s the maintenance that counts. That being said, I never recommend a hair cut unless I am totally confident in the cutter. Seems like you have a great stylist and a great prior experience. Personally, my hair is bouncing and behaving after a great cut. It also grows evenly and faster without those stupid single knot strands and split ends. Go for it! Thanks for all of the support ladies!!!! I REALLY want to get rescheduled soon as I miss having a nice shape without having to do extra steps to get it there (i.e. setting the ends on rollers)!!!! That left side is also really driving me crazy and I’m pretty sure some face framing layers would make it look so much better. You know I’ll let you know when it all goes down! Until then, guess I’m on my own … and, by that I mean, with my shapeless, scraggly hair … I will NOT be reaching for the scissors myself like Antoinette did! LOL!! IN the second to the last picture I can see the last bit of henna. My crown is a very troubling spot for me. It is the shortest part of my hair and never seems to grow. Gotta work on that!!!! Yes I would! I have some pretty ambitious length goals (mid back when straight, currently a few inches from bra strap when straight) so I may cringe a little at the thought but if it’ll look better I’d do it!